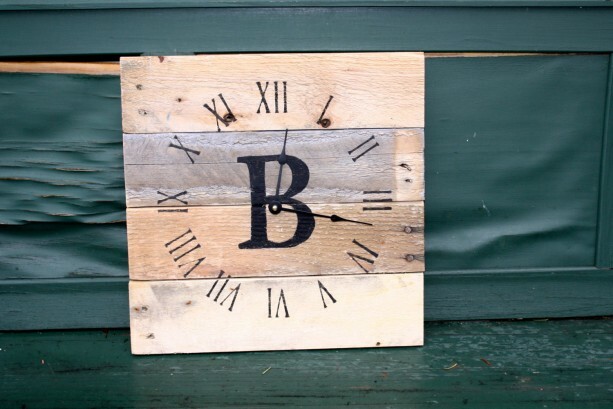 Modern yet Rustic MONOGRAM Pallet Wood Wall Clock. Choose Your Letter. Rustic. Wedding. Housewarming.Gift. Welcome to the one and only terrafirma79 designs. 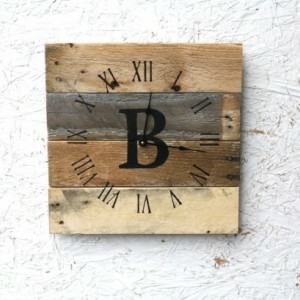 Thank you for considering our artisan pallet wood clock shop for your home decor or gift giving needs. 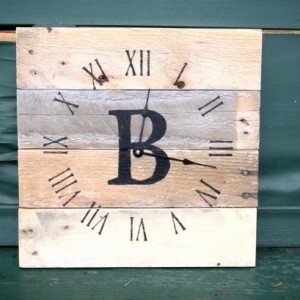 This clock could be an awesome Anniversary, Housewarming, or Wedding gift for him OR for her. 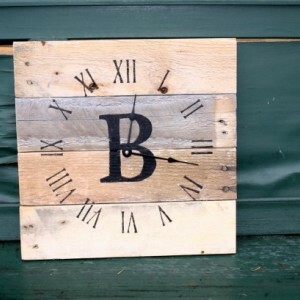 This exact clock monogrammed clock has been sold and hangs in lovely home in Seattle; and although it would be impossible to recreate the exact clock in natural tones of varying wood, this listing gives you the possibility to choose a clock in a reclaimed wood style with the monogrammed letter of your choice. (Please just type the letter in the buyer notes upon checkout). 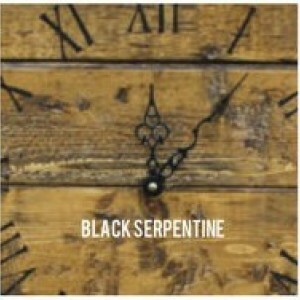 The clock in this listing has been sold already, but we can redesign a very similar clock. 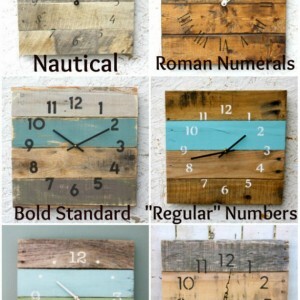 ♥ ♥ ♥ Be sure to check out our number styles and clock hand styles and select your color and type at checkout or write your preferences in the buyer notes section. 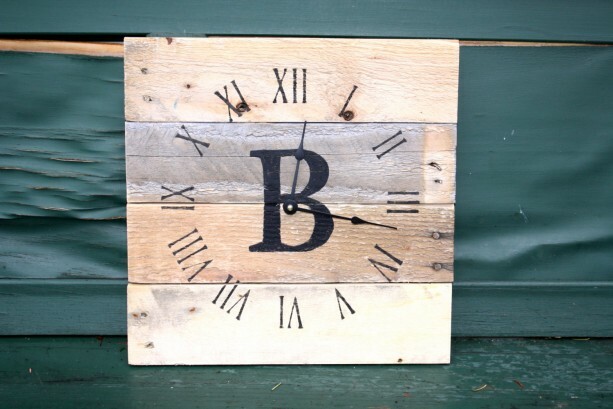 ♥ ♥ ♥ THE BASICS ABOUT YOUR CLOCK: •	Measures approximately 14 inches by 14 inches • Includes the letter of your choice in the color paint of your choice •	Varies in appearance as all wood grain & color will differ depending on what is available to us. •	Comes with a wire hanger for easy hanging on your wall •	Features a super quiet Quartz clock movement so you can rest peacefully •	Requires AA Battery, not included •	Currently takes approximately 2-3 weeks to cut, construct, design, paint, stain, test and pack and ship. (Thanks for your patience and understanding). •	Ships USPS, Priority Mail with tracking and insurance If you need your clock sooner than our typical turn around time, please send us a message to check if that's possible before purchasing. Want ideas for a CUSTOM ORDER? 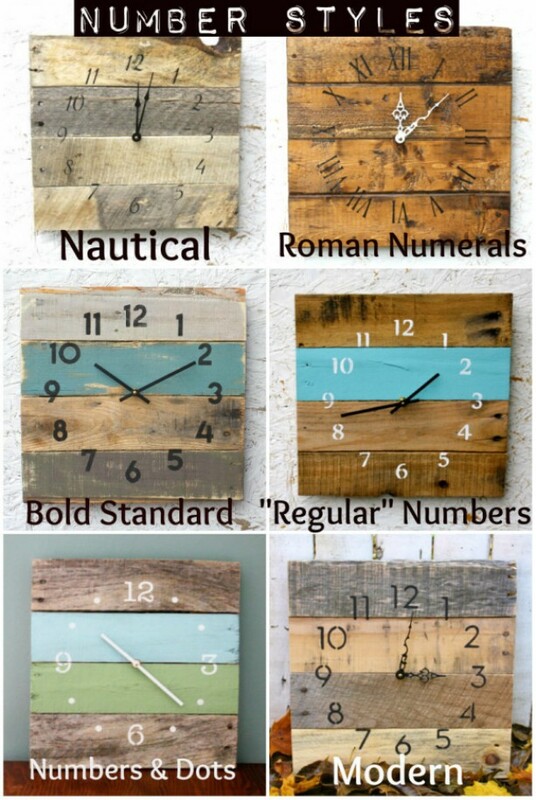 Please browse our many pallet clocks and feel free to send us a CONVO to discuss a custom order or ask any question you may have. 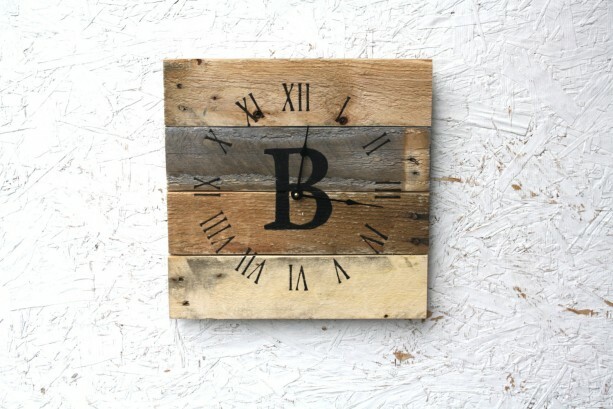 *Please keep in mind that all reclaimed wood is different which means all clocks are complete originals.. •Because we reclaim the wood we use for our designs, you can expect that each clock will be a unique work of art. The imperfections you may see will surely add to the authenticity of the art. ♥ Thank you so much for looking around our shop. :) ♥ *Note: All photos, listing descriptions, and designs belong to terrafirma79 and are protected under federal copyright laws. Any use of the aforementioned without our written permission is a direct violation of aftcra policy and is prohibited. Violators will be reported.